Ph.D. with minimum of 2 years Teaching / Research experience in Petroleum Engineering, Chemical Engineering, Computer Engineering/Computer Science, Mathematics, Geology/Geophysics. Ph.D with minimum 10 years Teaching / Research experience in Petroleum Engineering, Chemical Engineering, Computer Engineering/Computer Science, Mathematics, Geology/Geophysics. Master degree in psychology with specialization in clinical / social psychology with 2 years experience in psychological counseling in a Clinical, Medical or Academic institution of repute. M.Phil. in Clinical Psychology with 1st class, along with atleast 2 years of relevant experience. MA in Clinical Psychology with 1st class along with 3 years of relevant experience. Relevant experience is defined as counseling experience for group counseling as well as individual counseling in an educational institution or in a mental health-care-clinic. Desirable: M.Phil./Ph.D. in psychology preferred. of an academic institution of repute. Candidates will have to perform their best in interview as selection of the applicants will be made on the basis of their performance in interview conducting by recruitment panel of Indian Institute of Petroleum and Energy. #You will reach the home page and there hit on “Career” tab which is visible at the bottom menu bar. #A PDF of advertisement will open in front of you, read it carefully and check the requirements for job. #After that attach all the necessary documents and upload your recent passport size photograph. #Then recheck the details again and save the application form. #After that mail your application form at the above mentioned mail address. 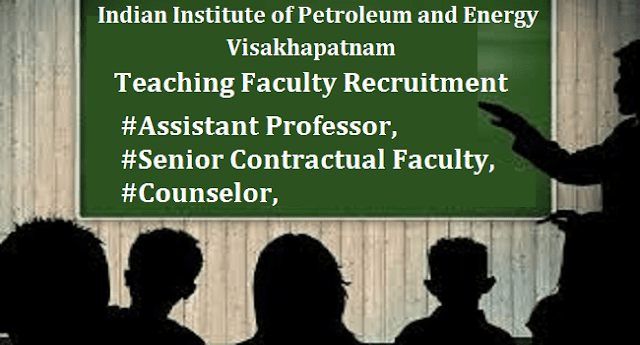 Indian Institute of Petroleum and Energy (IIPE) is envisaged to serve as the fountainhead for the nurturing of world class technical human resources capable of serving as the Leader and Innovator of tomorrow in the field of Petroleum Technology and Energy covering the entire hydrocarbon value chain. IIPE at Visakhapatnam, Andhra Pradesh, is granted by Govt. of India to start its admissions from the academic year 2016-17. The Visakhapatnam is the city of destiny with Bay of Bengal on three sides of the city and with IT sector and with several reputed giant industry like HPCL, Visakhapatnam Steel Plant, Hindustan Shipyard Limited, Coromondel Fertilizers Ltd, Andhra Petro Chemicals etc. The Kakinada-Visakhapatnam Petro corridor also helps the city to have lot of potential for educational organizations of international status to grow. With a high degree of autonomy in terms of its academic, administrative and financial functioning, IIPE grants degrees and other distinctions and titles just like the reputed IITs. Furthermore, IIPE enjoys the patronage and support of the Ministry of Petroleum and Natural Gas, Government of India. In view of the establishment of IIPE as outlined above, IIPE shall be an ‘Institute of International Importance’. The Institute is planned to develop high standards in imparting higher education in the field of Petroleum Technology and Energy. The curriculum of the Institution is proposed to be a specialized one and advanced with programmes at post graduate and doctoral level and specialized one year programs based on inputs from industry experts.